In the 19th century a need emerged to provide letter collection facilities in rural areas. Following trials, an official system of rural agencies was set up on 1 July 1900, and is still in operation, progressively integrated over the decades into the postal system. Initially, cancellations had only the name of the rural agency; later joined by the name of the Post Office to which it was attached. However, they had no date, so were (in theory!) not allowed to be used to cancel the postage stamp. Certain heavily-used agencies were "promoted" to "sub post offices" and used dated cancellers on the stamps. This section describes, illustrates and codifies all the known types of Postablagen and Posthilfsstellen cancellations. The most authoritative work on Postablagen is by Kühnel: "Postablagen in Österreich" (second completely-revised all-in-one-paperback edition, 2005) - APS library item 131. His type numbers and references will be quoted in the form [Kü-A1] and [Kü234e], the first meaning his Type A1 cancel, and the second office number 234, variety 'e'. Kühnel's book supercedes the work of Lessig ('Von der Briefablage zur Posthilfsstelle' in Österreichische Postgeschichte, vol 3, 1980 by Dr R Wurth) and Sobetsky (Katalog der Österr. Postablagestempel, 1963). This has the typical appearance of the pre-1900 cancels, although the office wasn't opened until 1901, halfway up a remote mountain pass in deepest Silesia. Although it appears as [Kü3941a] which gives Freiwaldau as the postal town, the postcard from which the example was scanned was actually cancelled on 3 April 1910 at Ober Thomasdorf, which is close to where the road to the pass joins the main valley road between Freiwaldau and Wurbenthal. Our code is B, ie it must be illustrated! [It is a Kühnel type P: P for Privat!] There should be an 'am' in the centre of the cancel. A second book of great relevance and interest is "České a Slovenské Poštovny 1900-1958" ie Postablagen in Czech Republic and Slovakia, by Petr Gebauer and Jozef Tekel, published in Brno in 2005 - APS Library 398. From the reign of Maria Theresia onwards, it was government policy that improved postal services should be made available to the populace. So, the Department of Commerce, which was responsible for the postal administration, dispatched von Gerl (the Director of Posts for Niederösterreich) in 1868 on a fact-finding trip to Prussia, Saxony and Württemberg, as these countries already had rural postal systems. In his report, von Gerl proposed the introduction of a rural post (Rural Letter Carrier Service) in Austria. His recommendations fell foul of the Treasury - not only might they have required the expenditure of money, but they were proposals for change, implying that the existing arrangements might be imperfect. It was eventually decided to proceed with the introduction of rural postal services in careful stages. 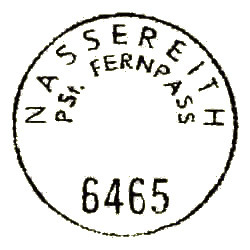 On 3 October 1868 authorisation was given to the Post Direction of Niederösterreich for the experimental introduction of a rural service at five post offices only. This development of the postal provision for rural areas proceeded at a stately bureaucratic pace. After 30 years there were in the entire Empire only 1680 Rural Letter Carriers, whilst in the same period the number of post offices increased from 2406 in 1868 to 5883. The Rural Letter Carrier (hereafter RLC) had to exercise practically all the functions of a post office, and in addition had to walk about, sometimes a considerable distance. An interesting article Die Postlisl und ihr Dienstweg ("Postie Lizzie's Round") in Die Briefmarke 8/1996 describes the daily journey of a postlady in the Zillertal around 1900. Each day in the summer, her round went from Mayrhofen via various Postal Agencies to the Berlinerhütte: a walk of over 20km including an ascent of some 1500m. And, after lunch in the Hut, she made the return journey. [Evidently exhausted by her work, she died in 1950, aged 74.] Several of the Postablage cancels of the Agencies she visited are described in another article in the same issue. As regards cancels, we must distinguish between two essential elements. The actual Rural Post canceller (Landbriefträger-Entwertungsstempel) was kept in each mailbox and served the RLC for the cancelling of the stamps on the letters posted in that mailbox. The cancelling was to be completed through an additional cancelling by means of the place - day - stamp of the responsible post office, so that as a rule a double cancelling resulted (occasionally the cancelling by the post office remained undone). As well as using the canceller in each mailbox, the RLC carried another in the postbag; however it was reserved for stamping the forms associated with registered mail and was not permissible for stamp cancelling. The RLCs met with their Postal Service colleagues at important points and handed over letters for places which did not lie on their route. Evidently there were difficulties here with the timetable of their journeys and so they left the post with a trustworthy inhabitant for transmission to the postman who would pass later. 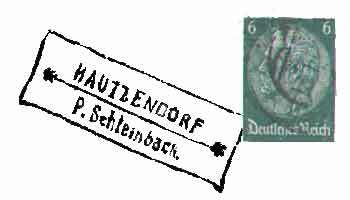 Thus small places where the setting up of a post office was uneconomic were connected, given permission for the sale of stamps and became established as so-called Briefablagen - Letter Agencies. All these arrangements had of course the aim of facilitating the connections with the postal service for the far-flung population of the rural areas. These activities, so important for the post, were undertaken by private individuals on an honorary basis. The permission of the postal administration was always necessary for this, and these people were selected carefully and had to be in close contact with the population of the locality. Thus mostly merchants or landlords were offered the job. The activity at a Letter Agency was limited to the sale of stamps as well as the acceptance of outgoing ordinary post (registered etc post was excluded), and a mailbox was normally sited at the house. The managers of Letter Agencies could also strike a handstamp on letters; however the cost of the handstamp wasn't reimbursed by the Postal Administration, which is probably why extremely few handstamps were produced and used, although a few oval, circular and 2 or 3 line private cancels are found. Letters also entered the system from the railways, so are found with official railway cachets. All such cachets and cancels were to show the origins of the letter, so were supposed to be placed alongside the postage stamp. Cancelling of the stamp was reserved to the Post Office under whose control the Postablage came, and to which the letter was eventually brought. The system proved successful, and the Postal Administration sought to include it in the formal postal organisation and to control its development. On 1 July 1900 the first Service Regulation for Postal Agencies came into force and most of the above arrangements became official. In consequence the managers were taken under contract by the Postal Directorate and paid for undertaking the Postal Agency business. The postal authorities provided the equipment necessary for the organisation, ie a sign with the inscription 'K. k. Postablage', an official mailbox, a rectangular steel handstamp with the agency name (in sanserif) flanked by 6 or 8-pointed stars and sometimes followed by the name of the Postal Town in brackets [Kü-A1], and the inevitable accounting forms. Beside the sale of postage stamps, the acceptance of outgoing un-receipted post as well as the emptying of the mailboxes, and in part also the delivery of the incoming post were envisaged. In some cases this had to be picked up first from the manager of the post office or at a nearby railway station. One line of text with stars in a box [Kü305b]. Used 20.6.1906. The letters are sanserif and there is no date so our code is gKo**. The Postal Town was Eben bei Radstadt, where the track reached the main valley. Filzmoos is in the Pongau district of Salzburg and now is an excellent holiday resort with modern roads and its own postcode 5532. Two lines of text with stars in a box [Kü2383b]. This is an example of a bilingual German/Czech cancel. Used 1.6.1903. The letters are sanserif and there is no date so our code is gKo**. The Postal Town was Friedland bei Mistek, in Moravia. Postage stamps were not supposed to be cancelled with the Postal Agency's stamp, as it had no date. The only exception was if the letter was not leaving the postal area of the Postal Agency, that is to say if the recipient also lived there: in this case the Agency manager had to undertake the cancellation. In later years, individual managers cancelled the stamps on all outgoing post and usually the postmark of the 'home' post office is missing from these items. Individual Letter and Postal Agencies not taken into official status in 1900 remained in service, some of them even surviving the collapse of the Monarchy. No official references can be found to these private Letter Agencies; it is thus possible that a few of them were first set up after 1900. All stamps of these Agencies normally have 'K. k. Brief-Ablage' or 'K. k. Post Ablage' beside the placename. From 1902, new Postal Agencies were issued with rubber handstamps, using seriffed script, but otherwise with the same layout as the steel stamps [Kü-A2,3,4]. In bi-lingual areas, both languages were used, separated by a horizontal line. Both these and subsequent types remained in use for a surprisingly long time - some specimens of the earliest types were still in use until replaced by postcoded versions in 1966! According to the regulations, if a canceller was lost or stolen, the replacement was to have two more stars, eg *HOCHSCHNEEBERG* would be replaced by **HOCHSCHNEEBERG**. One line of text with stars in a box [Kü552a]. Used 25.7.1915(?). The letters are serif and there is no date so our code is aKo**. The Postal Town was Puchberg am Schneeberg. Two lines of text with stars in a box [Kü4218a]. Used 6.3.1909. The letters are serif and there is no date so our code is aKo**. 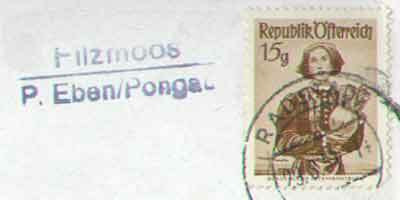 This is a bilingual cancel; the Postal Town was Königgrätz in Bohemia. Two lines of text in a box [Kü2343a]. Used 20.6.1914. The text was originally flanked by stars, but on 7.8.1912 the Postablage was upgraded to a Summer Post Office, a standard circular canceller issued, and the de-starred cancel kept as a Hut Cachet. The Postal Town was Canazei di Fassa in South Tirol. In 1903 an alteration to the Service Regulations made it possible to expand the activity of individual heavily-used Postal Agencies to include receipted despatches (eg registered, though excluding Cash On Delivery items). These Postal Agencies were issued with steel handstamps with date of use [Kü-B], first found in July 1905 at the Postal Agency of Schonbichl, and according to Kühnel's data still being newly issued in the late 1940s. The stamps of outgoing postal items were now generally cancelled with these new handstamps. They are rectangular, sometimes with rounded or chamfered corners, with the Postal Agency at the top, the date (occasionally including a despatch time) in the middle, and the Post Town, prefixed 'P.' at the bottom. The date may be flanked by stars. The typeface may be with or without serifs, and the month in roman or arabic numbering. In our classification system, if the box has a central horizontal line which is broken to receive the date, it's a type K2; if there is no such line it's a K.
Two-section box. [Kü268a]; our code aK2j**. This Mühldorf (there's another in Kärnten) is postcoded 3622 and is near Spitz on the Danube upstream of Krems. Single-section box. [Kü755j]; our code gKj. 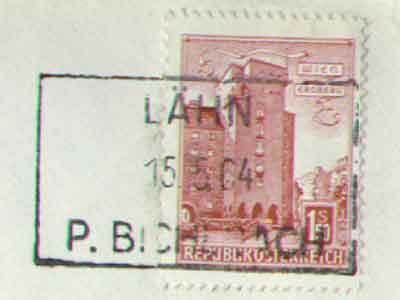 This cancellation from Lähn was issued in 1949 and used here at the amazingly late date of 15.5.1964; the Post Town was at that date Bichlbach in Tirol. Two-section box split for the date. [Kü401d]; our code aK2je. Going is next to its Post Town of Ellmau in Tirol; the office is now renamed Going am Wilden Kaiser and has its own postcode of 6363. Cancelled 25.8.1937 and an unreadable dispatch time. There do not appear to be stars flanking the date. Single-section box. [Kü1420i]; our code gKje. Kössen is in Tirol. The postcard also has a hotel cancel. 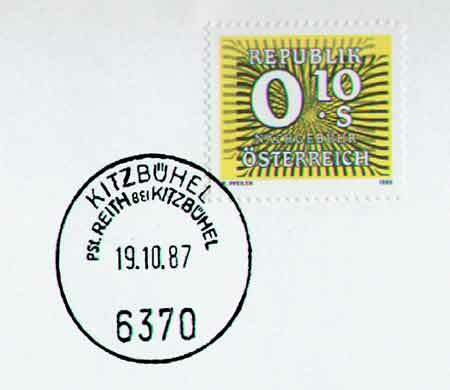 In 1914, private Postal Agencies began to introduce a changed wording of the rectangular handstamps: the name of the postal town was prefixed P. or Post [Kü-C2]. By 1916 this type was in use in official Postal Agencies. One line of text with stars in a box. [Kü305c]. Used on a postcard around 1930. The letters are serif and there is no date so our code is aKo**. One line of text with stars in a box. [Kü1624b]. Used on a postcard in 1939. The letters are serif and there is no date so our code is aKo**. Unternberg's Post Town is Tamsweg in Salzburg. 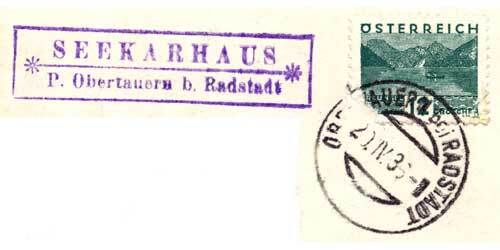 Around 1925, a 2-line version appeared, [Kü-C4], with a horizontal line flanked by stars separating the Postal Agency above from the postal town below. [Kü1432b]. Used 20.4.1933. The letters are partly serif and there is no date so our code is aKo**. Seekarhaus's Post Town is Obertauern bei Radstadt in Pinzgau. Two lines of text with stars in a box. [Kü511f]. Used in 1938. The letters are partly serif and there is no date so our code is aKo**. 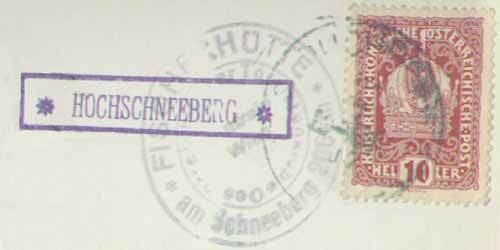 There is an unreadable cancel on the stamp - presumably Schleinbach, which is in Niederösterreich in the Weinviertel, and has the postcode 2123. [Kü46b]. Used 2/12/1939. Our code aKo**. Altweitra is now called Unserfrau-Altweitra, and Weitra is postcoded 3970 and is in Niederösterreich near Gmund. [Kü698e]. Used in 1938/45 period. The cancel is "KLEIN SCHWEINBARTH / P. Drasenhofen". The letters are sanserif and there is no date so our code is gKo**. Drasenhofen is north of Wien and has postcode 2165. [Kü1764f]. Used 23/5/1941. 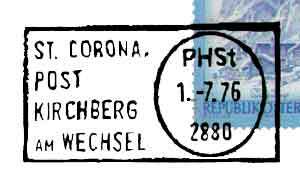 The cancel is "WÖSENDORF / P. Weissenkirchen i. d. Wachau". The letters are partly serif and there is no date so our code is aKo**. Weissenkirchen is postcoded 3610 and is on the Danube upstream of Krems. All the types described above remained in use until the annexation in 1938 of Austria by Germany. This brought two changes to these Postal Agencies. They now received the name 'Posthilfsstelle' or 'Poststelle II'. Some cachets had Post replaced by über [KüD-1,2,3,4]. Others had the German zonal postcode 12a & 12b for Austria, introduced in spring 1944 although examples are rarely seen [Kü-D5,6,7]. [Kü265e]. Used 22.1.1942. The faint cancel is "Elixhausen / über Salzburg 2" in a 2-section box, the letters are 'Gothic', and there is no date so our code is aK2o. [Kü1764g]. Used 28/5/1942. 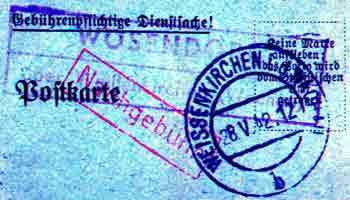 The cancel is "WÖSENDORF / über Weissenkirchen i. d. Wachau". The letters are partly serif and there is no date or stars so our code is gaKo. The illustration is in false colours so that the cancel is visible!. Typical Post Zone 12 cancels look like this! Immediately after the end of the war in 1945, the agency name reverted to Postablage. 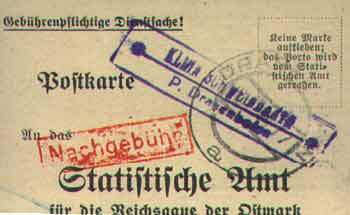 Wherever they had survived, the old Postablage cancellers of the First Republic were used, failing which the German Reichspost ones. The next step was the physical removal of the 12a or 12b post zone codes (and Nieder- or Oberdonau) from the Reichspost cancellers. 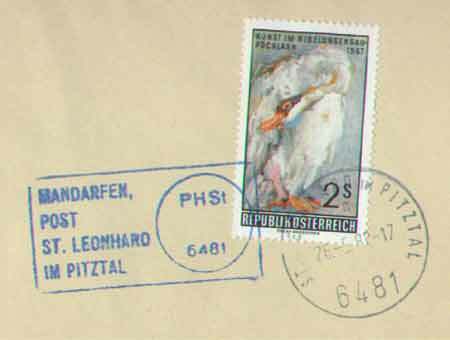 According to Lessig, the first new Austrian Postablage cancellers of the Second Republic were produced in March 1946. These were double-spaced rubber stamps without frames or central line; the first line contained the place-name preceded by 'Postablage', and the second line contained the post office name preceded by 'Post'. 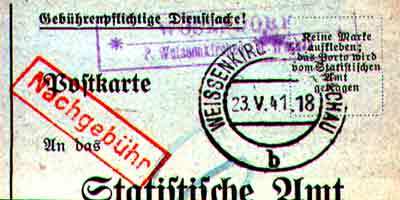 They were issued to three offices only: Postablage Ertl, Post Sankt Peter in der Au; Postablage Ingolsthal, Post Friesach, Kärnten; and Postablage Kirnberg, Post Sankt Peter in der Au. Lessig adds that in May 1946, most of the remaining Postablagen received their new cancellers, which differed from the March one by the omission of the word 'Postablage' in the first line. In April 1947 a new Postablage canceller subtype was introduced, differing essentially from the 1946 types by having a horizontal rule between the text lines, a full stop in the first line after the Postablage's name, and in the second line a 'P.' before the Post Office name. 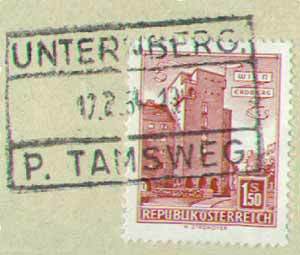 Kühnel, however, states that from 1945 new Austrian 2-line rubber cancellers were introduced, with the post office name preceded by 'P.' or 'Post' [Kü-E]; at first they had no horizontal rule between the text lines, this being added to those issued later. He makes no particular comment on a Postablage prefix. While the three offices mentioned above do appear in his catalogue as 'Postablage X / Post Y', this type of canceller is listed as in use at these offices from 1949/51 only. Pre-war or modified wartime cancels were in use up till then. 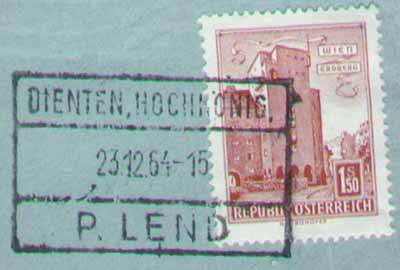 Indeed, Ingolsthal is listed as using a Postal Zone 12b canceller up to 1950! We will follow Kühnel's opinions. Two lines of text, no box. [Kü41a]. Our code aLo. Arbesbach is in Niederösterreich near Zwettl, postcoded 3925. The canceller was issued in 1954 when the office opened; this example was used in 1956. Two lines of text, no box. [Kü305f]. Our code gLo.This example was used in 1951. Note that although the Postal Town is the nearby Eben im Pongau, the postcard has been cancelled at Radstadt, the main local market town to which the postbuses run. Two lines of text, no box. [Kü593i]. Our code gLo. 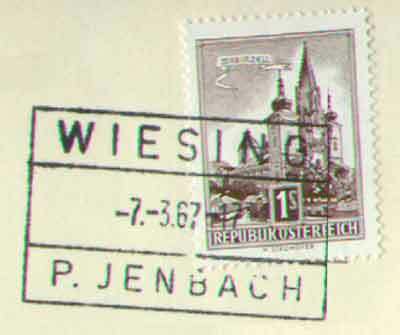 This example was used in 11.7.1956, and the stamp has an Ortswerbestempel of the principal town of Pongau, St Johann - which was its Post Town from 1892 till 1954. By a decree of 1957, 'Posthilfsstelle' became official. This new period saw the introduction around 1960 of a rectangular three compartment box (our code K3), [Kü-F2,3], with the name of the agency at the top, the date including the hour in the middle and the Post Town at the bottom. This was struck on the stamp, presumably indicating that the agency had evolved into a regularly-operating sub-post-office (to use the British term). A few of these three compartment box types do have the chamfered or rounded corners similar to the so-called railway station cancellers. Three-section box. [Kü200n]. Our code gK3je. Lend is in Salzburg south-west of Bischofshofen. The canceller was issued in 1960; the office opened in 1899. This example was used in 1964. Three-section box. [Kü1746c]. Our code gK3je. Jenbach is the terminus of the Zillertalbahn and the Achenseebahn, in the main Inn valley near Innsbruck. This example was used in 7.3.1967. Three-section box. [Kü1730j]. Our code gK3je. The Post Town Pfarr Werfen is in Salzburg near St Johann im Pongau. This example was used in 17.8.1966. Three-section box. [Kü1624g]. Our code gK3je. This example was used in 17.2.1964. A major change occurred with the introduction of the Post Code system in 1966. The Post Towns duly received their four figure Postcodes but understandably this numbering did not extend to the small collecting agencies which still retained their term 'Posthilfsstellen' (abbreviated as PHSt). A new style canceller was developed to incorporate all the relevant data in one strike. This was a horizontal rectangle enclosing at the right a single circle. [Kü-G1,2] if rubber, [Kü-3,4] if steel. On the left in three or four lines of sansserif capitals are the names of the Posthilfsstelle and its Post Town separated by the word POST, and in the circle 'PHSt' above the date (day, month, year, no hour) and below that the postcode number of the Post Town. On 1 March 1981 the term 'Posthilfsstelle' was simplified to 'Poststelle', abbreviated as 'PSt'. We have classified this type as "KE" ie a box and circle, keeping the code in its current-period abbreviated form in line with P1, P2 and P3. They are also known without a date, which would be coded "KEo". PHSt-Postcode type, our code KEo. [Kü834e]. Note that the violet cancel covers the stamp, contrary to regulations! This example was used on 26.5.1982. PHSt-Postcode type, our code KEo. [Kü303e]. The Fernpass connects Nassereith and Lermoos in Tirol. This example was used on 26.5.1978. PHSt-Postcode type, our code KEo. [Kü303f]. The Alpenhotel was dropped from the canceller; it's the same place. This example was used in 10.5.1982. PHSt-Postcode type, our code KE. [Kü12159h]. Kirchberg am Wechsel is south of Neunkirchen. The canceller was issued in 1968; the office opened in 1912. This example was used in 1976. PHSt-Postcode type, our code KE. [Kü545g]. Ach is opposite Burghausen (in Germany) on the Salzach. The canceller was issued in 1968; the office opened in 1902. This example was used in 1980. PHSt-Postcode type, our code KE. [Kü1782k]. Vöcklabruck is in Oberösterreich. The canceller was issued in 1967; the office opened in 1892. This example was used in 1980. A further change was made in the mid-1980s to a less distinctive style more in line with the basic P2 circle in general use at all Post Offices. The single circle contains the names of the Post Town and the Poststelle as two arcs at the top, the latter prefixed with 'PSt', the date usually with no hour [hence classified as P2(e)] across the centre, and the postcode of the Post Town at the base. [Kü-H1] if rubber and no date; [Kü-H2] if steel with date. Some variations of this type occur, though rarely, eg putting the Poststelle name first, or no date, or in the case of a Two-Triangle-Town squeezing in the triangles as usual at the sides of the Postcode. P2 handstamp but without date, counter letter, or despatch indication. [Kü303g]. Our code P2(b)o. This example was used on 21.7.1983. Conventional P2 handstamp with neither counter letter nor despatch indication. [Kü1198c]. Our code P2(be). Conventional P2 handstamp with counter letter but no despatch indication. Our code P2(e). [Kü597a]. This example was used on 11.12.1989. 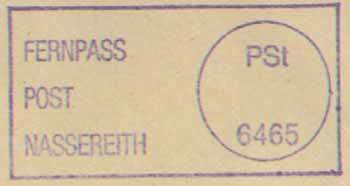 Unusual arrangement within P2 handstamp, with both counter letter and despatch indication. [Kü748c] Our code P2. This is a shop/petrol station in Laaerbergstrasse in Wien 10, and the illustration shows a 'first day of use' cancel. Roller P2 handstamp with neither counter letter nor despatch indication. Our code RP2(be)+T. [Kü557i]. This example was used in 4.7.1989. 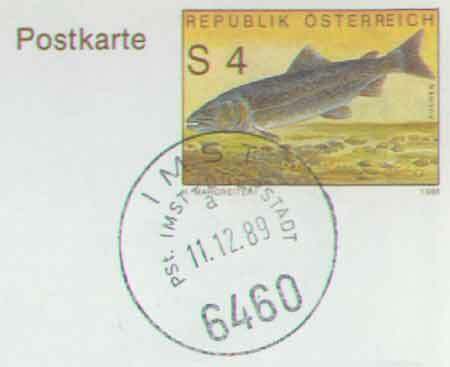 The Austrian Post Office produced a listing of Posthilfsstellen in 1981, which is here. Note that many offices will have been closed, upgraded - or conceivably opened - since then! 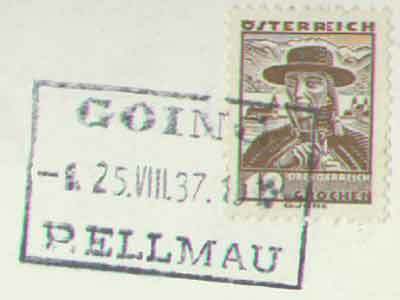 Other postal markings can be found from Posthilfsstellen. 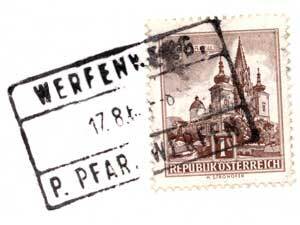 The example on the left was used on a cancelled-to-order postcard at Allerheiligen, Post Perg, in Jan 1961. It measures 22 by 12 mm, and is probably the canceller used for putting the office name on documents! The one below was found on the back of an envelope which had a normal KE-type cancel dated 2.1.61 on the front. Cachets such as the following can be found from almost every hotel, restaurant and mountain hut. Almost always, they have no postal function, and serve only to advertise the place of sale. The Moserboden hotel used to be in the Kaprun valley, where the dams are; the card is dated 1900 and the stamp cancelled KESSELFALL-ALPENHAUS. The Valluga-Bahn is at St Anton; the card is dated 1957. 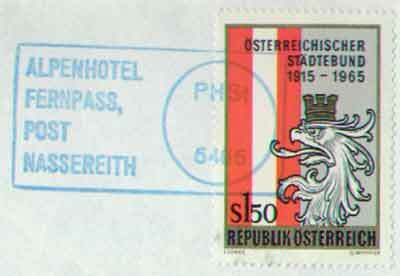 Kühnel: "Postablagen in Österreich" (second revised edition 2005) - APS library item 131. 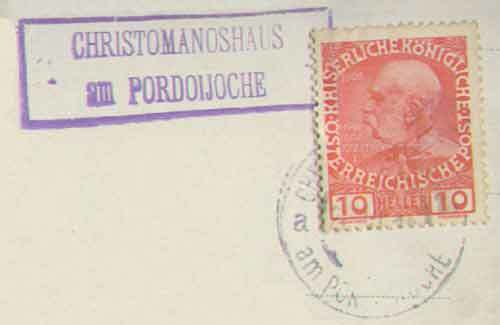 And as a postscript both to the Austrian Empire and to this article, the cancel shown here is from the Sudetenland area of today's Czech Republic, and was used on 4 August 1928. 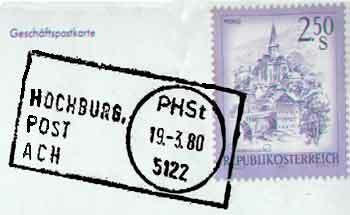 It is on a postcard, with the stamp cancelled at Karlova Studanka / Karlsbrünn in Schlesien.